This is the official making of book which fans of the beloved movie series of all time has been waiting for 30 years! 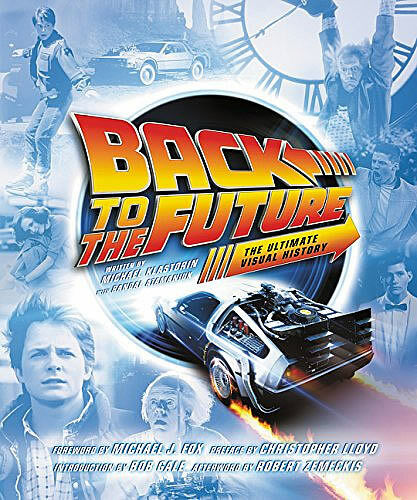 Written by production publicist Michael Klastorin and BTTF uberfan Randal Atamaniuk, this 224 pages hardcover, coffee table size book is as what the book title proclaimed – The Ultimate Visual History. It’s packed with generous anecdotes mostly from the key filmmakers themselves including director Robert Zemeckis, writer Bob Gale, producers Steven Spielberg and Frank Marshall. The process of how and why Michael J. Fox replaces original star and method actor Eric Stoltz is the main juicy news of the first Back to the Future besides the long, tiring time it took Zemeckis and Gale to bring their script to screen. It’s not just Stoltz who is giving problems though but Crispin Glover who plays George McFly as well. The main cast members Fox, Christopher Lloyd and Lea Thompson also has their fair share of stories to tell as well as some of the crew who had worked on the movie series liked costume designer Joanna Johnston which obviously adds more credibility to the book. The book is so informative that it also delves into the various incarnations of the script before it became the final version you seen on screen. But you are probably distracted by the inclusion of largely unseen concept art, storyboards and behind-the-scenes photos since it’s a movie produced long before the Internet and social media came readily available. Who doesn’t love the concept drawings by artist Drew Struzan. I personally love Back to the Future Part II for the wild crazy depiction of the future. It’s 2015 right? Though in actual fact we have yet perfected any flying cars, hoverboards, self-lacing Nikes, it’s always fun to revisit how production designer Rick Carter and special effects supervisor Michael Lantieri dressed up and recreate the old Universal Lot as the 2015 courthouse square for Zemeckis’ vision. Whereas movies are made on the computers nowadays, it’s always good to see how movies are made in the old days. Actual sets, physical effects and yes the amazing iconic DeLorean, not entirely realized in CGI. Furthermore, it’s packed with multiple prop replicas liked Sepia photograph of Marty and Doc from Part III, Jaws 19 movie poster, Doc’s note to Marty from 1885, Blast from the Past receipt from Part II and many more. My only gripe is the replicas are clumsily stick on to the pages which make them vulnerable to losing over time. Back to the Future: The Ultimate Visual History not only looks good but it’s also packed to the brim with so much detail and secrets that it will make Doc Brown blush. If you have only enough budget to get one book this year, make it this one!